For those who are sensitive to gluten, eating out or enjoying an occasional fast food feast can be a distant dream. For the rest of us, it will benefit to know that unless we are plant embryos, it is not likely that we will have anything to gain from gluten even if sensitivity or allergy is not the issue. Wreaking havoc in the intestines leading to irritable bowel syndrome and associated problems are some of its effects to mention. Many researchers have also comprehensively proven that excessive gluten intake can propel certain brain related diseases. Besides these, a list of auto immune diseases has also been linked with these otherwise naturally occurring substances. So, with all these threats showered at you, you will certainly think twice before picking up your bread from the store or choosing fried food in your menu while ordering it. Considering the fact that this substance is existent in almost all common cooking ingredients, making a claim as glorified as ‘gluten free’ in today’s kitchen can amount to considerable stress. Unless the label mentions the term ‘gluten free’, it is likely that gluten is present on your plate. In all honesty, a certain section of food lovers have not yet been convinced about the fact that you can actually cook tasty food without the presence of gluten. 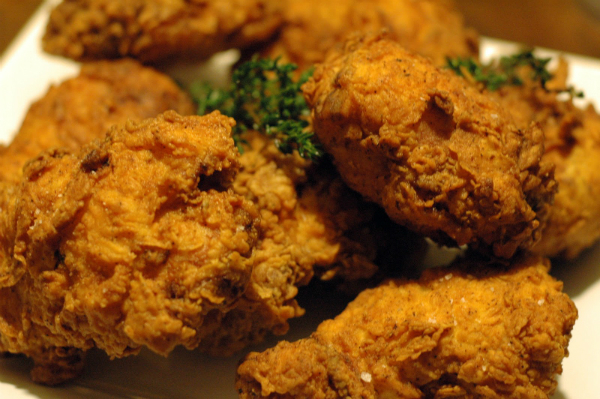 Fried chicken is one of the most common and loved food in not just America but the world over. However, almost all these recipes include gluten which makes it an impossible feat for those conscious of this substance. Ingredients – 5 ounces chicken (preferably thighs amounting to 4 pieces); eggs – 2pcs; almond flour 1 cup; garlic powder 2 teaspoon; paprika 1 teaspoon; pepper ½ teaspoon; salt to taste; olive oil as necessary for frying. Process – Mix the almond flour with garlic powder, paprika, salt and pepper evenly in a bowl and set aside. Whisk the 2 eggs in another bowl and set aside. Now take the chicken pieces one by one and dip them in the whisked eggs and allow the excess the drain. Follow it up by dropping them into the flour mixture. Repeat the process with all the chicken pieces and set them aside on a tray to set. Heat olive oil in a pan to medium and fry the coated chicken pieces till it assumes a rich golden color. It will take around 20 to 25 minutes for both sides to cook evenly. Remove chicken from the oil and place on an absorbent sheet so as to drain the excess oil. Plate up and indulge in a safe and delicious treat!